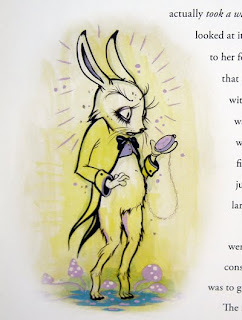 My giveaway of the book Alice's Adventures in Wonderland illustrated by Camille Rose Garcia ended today and I wanted to write up a review of the book, which you can purchase here on Amazon. When the publisher, It Books, approached me about doing a giveaway for this book, I was immediately excited, because I like art and have been a fan of Camille Rose Garcia for a number of years. She does creepy fairytale type art and books. I was also really excited to find that they wanted to send me a review copy. This book is really beautifully made. I collect books and wish that I could say that I only have a small collection! These days, I have to be selective about what books I keep and then the rest I take to the used book store. This book is definitely in the keeper category! A great deal of care has been put into making it the kind of item a book-loving sort of person can get into. The jacket is beautifully illustrated and has glossy spot varnish on the black areas, and a capital A has been debossed in foil on the front cover of the book. If I had any wish for the book, I would have liked a different typeface for the text, because the text ends up looking a bit small. But that's my only real complaint. It has beautiful endpapers (I love it when a publisher pays attention to details like endpapers), and the pages of the book have been printed to look aged, which is a charming touch. 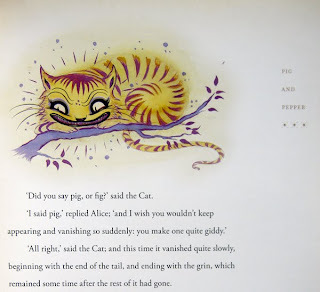 For me, though, the real magic of the book are the illustrations. 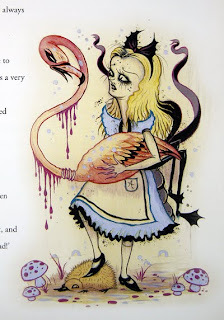 Garcia's work is beautiful, playful, and haunting, which is very fitting for an edition of Alice in Wonderland. The characters in the illustrations are emotionally expressive and inventive. Her artwork really speaks to me, and is reminiscent of some of my favorite book illustrators of the early 20th Century. So artists such as Frank C. Pape, Mahlon Blaine, Felix Lorioux and even Edmund Dulac. I'm sure that a lot of people already have an edition of Alice in Wonderland on their shelf. The reason to add this book to your collection would be Camille Rose Garcia's illustrations. On a final note, Camille Rose Garcia will be doing a book signing tour in March. She will be visiting LA, San Francisco, Portland, and Seattle. Check here for dates and locations. Yeah! I'll be going to the Portland date.